I am still puzzling over why the MUFON State Director instructed me not to talk to anyone unless they showed me their MUFON I.D. Badge, but then the MUFON Field Investigator who called to interview me not only didn't have his I.D. Badge at the ready when I asked to see it, he apparently demolished his house looking for it. He didn't have the next best thing, either: the MUFON windshield sun visor. Then when I asked the Field Investigator why the State Director had warned me not to tell anyone outside of MUFON about my experience, he said I shouldn't worry about that. It is, he admitted sheepishly, a quirk of the State Director, and not an official MUFON policy... He suggested that I call the State Director to ask her about her gag order, and I think I must. In fairness, though, after that somewhat shaky start, the interview went well, and I enjoyed it quite a bit. 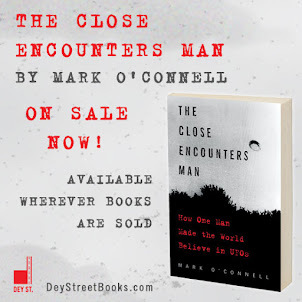 The Field Investigator did a thorough and thoughtful job interviewing me, he filled me in on some other unexplained phenomenon in the area to help me put my experience in context, and he was just an all-around nice guy to talk to. The whole thing was very scientific, and it's kind of cool to know that the ordeal that my wife, daughter and I went through will now be added to MUFON's massive database of UFO encounters, and may someday provide some small clue to solving the UFO mystery. And yet... while we covered all the scientific facts, we never talked about what any of it meant. I suppose that wasn't the real aim of the interview, but I couldn't help feeling that something had been left unexplored, maybe a lot of things. I think that's something to consider going forward. I know what was explored, though: the Field Investigator's closet. 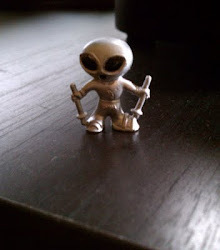 A short time after we finished the interview, he emailed me a photo of his freshly-found MUFON I.D. Badge. I bet the girlfriend found it.